The ice bucket challenge is probably the biggest social media phenomenon this year. It was launched as a fun way to raise awareness and funds for The ALS Association, everyone from David Beckham to Anna Wintour has now completed the Ice Bucket Challenge - and nominated famous friends to take a drenching too. 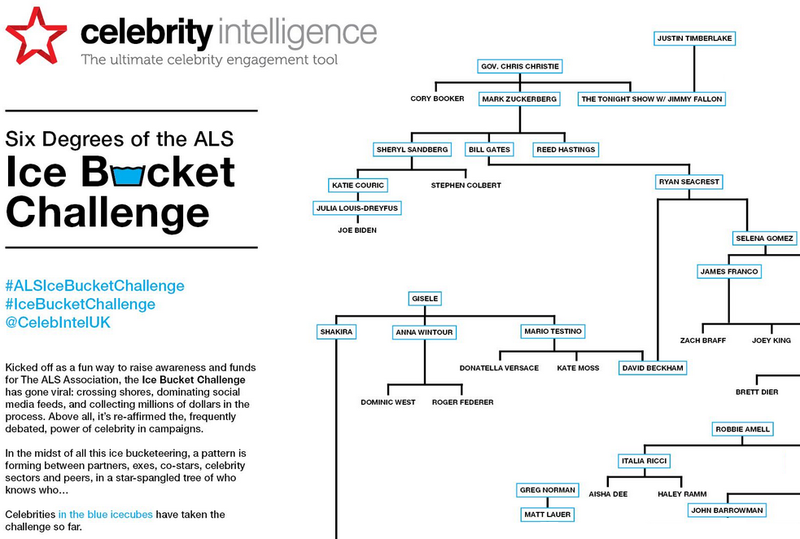 We now know that ice bucket pioneers included Mark Zuckerberg, Today Show presenter Hoda Kotb, and – Justin Timberlake. These nominations have exposed a complicated network of partners, exes, co-stars and peers - now compiled into an infographic by celebrity and media database Celebrity Intelligence. Click here to check the enlarged inforgraphic.